We were asked by some cyclists in New Zealand for a suggested route from Melbourne to Albury. In typical style I'm going to suggest a tour we haven't done! In fact, I'm suggesting a tour I want to do. It goes through the Snowy Mountains, the Australia capital Canberra (more of a theme park than a city! ), the rural southern highlands of NSW and takes in some of the most spectacular coastal country and national parks right on Sydney's doorstep. Vline or Bike via back roads. Beautiful country but the road (“The Barry Way”) is dirt and very rough! There is a pretty good bike track that bypasses the worst of Wollongong. A section of the coast road is currently closed off (protected by armed security guards!). Can be avoided by catching the train from Scarborough to Coal Cliff. This route either crosses the mountains twice (we haven't ridden the Victorian part yet). The climbs from Khancoban to Jindabyne are the toughest in Australia! The other route via Buchan is over rough dirt road. We did it on our touring bikes once, but they didn't exactly survive intact. I think for MTB tourists only. It's possible to ride from Melbourne to Sale, but it's not the greatest ride on earth. A detour via Wilson's Prom might be enjoyable for rain loving hikers (book your camp site ahead!). For a short tour I recommend the train. The rail line from Sale to Bairnsdale is being re-opened. It was supposed to have re-opened where we were last there in November 2003, but it still hadn't. In any case it's not such a bad ride from Sale to Bairnsdale using the back roads to the south of Highway 1. There are numerous routes from Canberra to Kiama. Most are pretty good, but don't reach the coast south of Kiama (too busy). The Federal Highway is freeway standard from Canberra to Sydney, and it's both legal and has wide (relatively) safe shoulders to ride on. 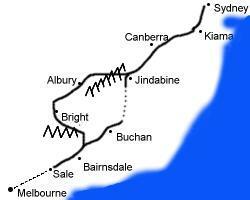 My favourite route is via 'The Highland Way” through Bundanoon. Kiama -> Jambaroo -> Albion Park -> Albion Park Rail -> Oak Flats ->Warilla ->Wingdang (join bike path here) -> Port Kembla -> Wollongong -> Thiroul (rejoin Lawrence Hargrave Drive here) -> Scarborough (catch train one stop to Coal Cliff) -> Royal National Park. Catch a Sydney train into the city from either Waterfall, Sutherland or Cronulla (catch ferry from Bundeena).